After signing up for a MyGet account and creating a feed that serves as an npm registry, you can work with node modules (packages) using the npm command line and package.json. 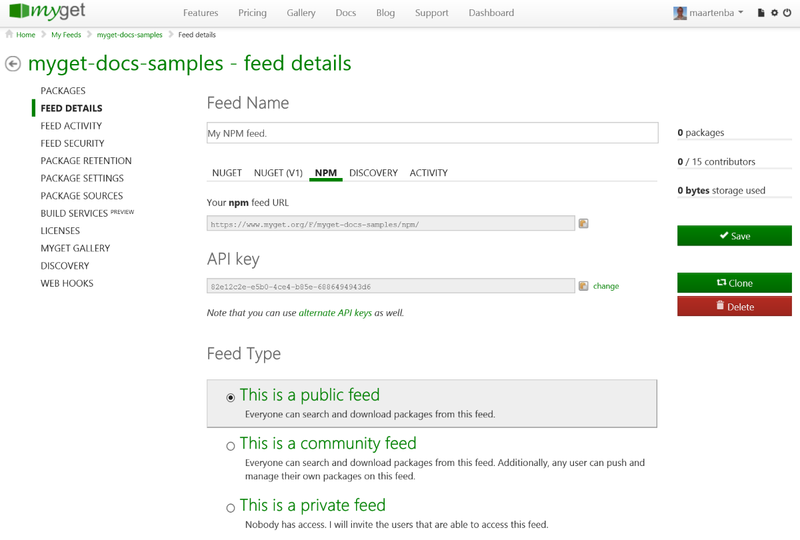 The full URL to your npm feed on MyGet can be found on the feed details page. This URL can be used with any npm-compatible client. Note that a pre-authenticated URL is also available for private npm feeds. By default, your MyGet npm feed will only contain packages you have explicitly added, either using the web UI or the npm client. To have the public npm registry blended into your own, go to the Upstream Sources tab, edit the Npmjs.org upstream source and enable the Make all upstream packages available in clients option and the the Automatically add downloaded upstream packages to the current feed (mirror) option. npm config set ca ""
Note: Another approach to mixing repositories is to make use of scoped packages. If you want to publish a node module to a registry, you usually run the npm pack command. This is not different with MyGet: npm pack will package your node module into a .tgz file. Provide your MyGet username and password to make sure authentication is set up. Note: If you have any special characters in your username or password, such as an @ or a space, make sure to use the URL encoded value (e.g. %40 for @, %23 for #, %2F for / and so on). Important! As per the npm publish docs, MyGet will add the latest tag to the published package, unless a different tag is specified using the --tag switch. In our UI, we will show the latest version by semantic version, whereas the npm client will make use of the tags to check for latest version. Provide your MyGet username and password to make sure authentication is setup. Tip: Use the npmrc module to make switching between different .npmrc files easier. The npm command line client does not suport mixing multiple registries. Make sure to enable upstream source proxy if you want to blend your own feed and the public npm registry. Running npm install will make sure any dependency is downloaded from the default npm registry, except for those where a full URL is given. Note: If you are using a private npm feed, it is recommended to make use of a pre-authenticated URL to make sure no HTTP error 401 or 403 are returned during package download. The MyGet npm registry feed supports working with scoped packages. 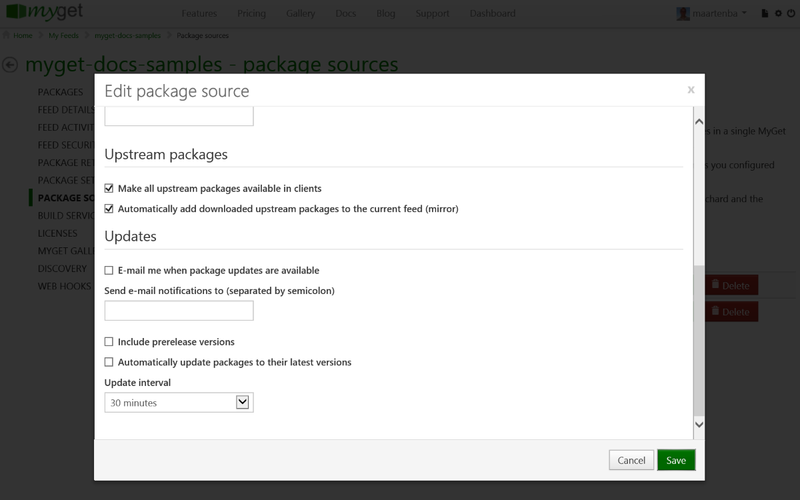 Scoped packages are "scoped" to a specific registry. E.g. all packages scoped @acmecorp may be retrieved from a MyGet npm registry feed, while other scopes and non-scoped packages flow in from the default npm registry. More information on scoped packages is available from the npm docs. Scopes can be associated with a specific registry. This allows for seamless mixing of packages from various npm registries. From now on, we can publish and consume any package that has the @acmecorp scope. Npm will automatically direct requests to the correct registry. Note: packages.json must not contain a publishConfig property. If it does, make sure it points to the correct registry or remove the entry. The npm client will always push to the registry specified in this property, no matter which registry is specified on the command line. The npm client only supports working with one "main" registry. This can be circumvented by aggregating multiple registries into a MyGet registry feed using upstream sources. However, sometimes it's enough to work with one "main" registry and just fan out to other registries for specific scopes. Since scopes can be associated with a specific registry, we can seamlessly mix scoped packages from various npm registries. For example, we could register the @acmecorp scope to go to our own MyGet registry feed, @some-vendor to hit the npm registry supplied by a vendor, and use Npmjs.org as the "main" registry. Use Npmjs.org as the "main" registry, since we did not set the registry option. Use https://www.myget.org/F/your-feed-name/npm/ for the @acmecorp scope. Use https://npm.example.com/ for the @some-vendor scope. A common cause are special characters in your username or password. For special characters such as an @ or a space, make sure to use the URL encoded value (e.g. %40 for @, %23 for #, %2F for / and so on). When working with private npm registries, it is required to run npm login to store authentication details into a .npmrc file in your user profile folder. Some npm versions miss writing one specific setting, resulting in 401 Unauthorized when working with MyGet npm registries. Note: Depending on the npm version being used, a trailing slash (/) may or may not be needed for the URL's in .npmrc. When authentication fails, make sure to try both the URL with and without the trailing slash. Additionally, you may want to run the SSL checker and verify your computer has all required certification authorities installed. When using a company proxy server, make sure to configure it correctly. Justin James has a great guide to npm, bower, git and bash proxy configurations available.